If you are looking at Jet wood lathes, you have a number of options. There are currently a total of nine different Jet woodworking lathes on the market. I covered the Jet mini lathe models and the big 16" wood lathes on separate pages, so here we will take a look at their mid-size machines. Each of the Jet mid-size lathe models gets above average ratings and reviews. Overall the JWL-1236 and JWL-1442VS(K) are solid, good-quality machines that are competitively priced, but each model has its own quirks and drawbacks. We'll cover each of them below. The smallest of the mid-size Jet woodworking lathes is the Jet JWL-1236. It has a 12" swing over the bed, with an 8-3/4" swing over the tool rest. The distance between centers is 34-1/2", and it comes with a 3/4 HP motor. The 1236 Jet wood lathes utilize a Reeves-type belt drive system that offers speed changes on the go, with 6 different speeds available from 550 to 3000 RPM. The headstock swivels on the base so you can do outboard turnings up to 16-1/2" in diameter. It also has an indexing mechanism, and a hollow tailstock with a removable pin in the live center. The Jet JWL-1236 comes with a steel stand. The Sawmill Creek forum has a number of folks that own one of the JWL-1236 Jet wood lathes and say that they are a good machine for a beginner. Many owners comment that the JWL-1236 is smooth, quiet, and has adequate power for its size. There are a number of other companies that produce "clones" of the Jet JWL-1236, and it has been said that imitation is the sincerest form of flattery! The most popular "clone" in the US is the Harbor Freight #34706. Some people assert that it is exactly the same machine with different color paint, but the Harbor Freight woodworking lathe is actually slightly different if you look closely. Some folks have said that the Harbor Freight machine doesn't live up to the quality standards of the Jet wood lathes, but you will have to be the judge. There is a big price gap between the Harbor Freight woodworking lathes and the Jet JWL-1236! There are a number of common comments that you will find about the Jet JWL-1236. One is that the stand is too short for tall people, but that is easily rectified by building a simple platform for the lathe to stand on. Many folks feel that it is not well suited for larger projects; the lowest speed setting is not slow enough and the motor is underpowered for large diameter turnings. The motor also extends slightly into the work area if the workpiece is very large at that end, making it necessary to use a spindle extender or different face plate. The Jet JWL-1236 also is not heavy enough by itself, but that is easily fixed by adding a shelf on the base for sandbags or other ballast, which many owners have done. The Reeves drive system is one feature you need to know a little about before you buy one of the mid-size Jet wood lathes. With a Reeves drive you don't have to turn the machine off and move a belt to change speeds. You move a lever to change speeds while the motor is running, but it also requires that the motor be running to change speeds! This means you need to remember to set the lathe to its lowest speed setting before turning it off, because you don't want to set up a large, unbalanced blank and then have it start spinning at 3000 RPM. Of course, you can always start the lathe "empty" and dial the speed down before you mount a new blank, but it can be a hassle if you forget. The Reeves drive uses cone-shaped sliding pulleys that require occasional cleaning and lubrication. One owner states that it only takes about ten minutes twice a year to service it. The Reeves drive also tends to wear belts a little faster than the conventional pulley system found on many other woodworking lathes. Some people think the Reeves drive works great; others are not fond of it. It certainly has its pros and cons. Like Mama used to say, "It's not wrong, it's just different!" I do have to say here that on the woodworking forums, when someone would ask for opinions because they were thinking about buying one of the JWL-1236 Jet wood lathes, a number of times other woodturners suggested considering the JWL-1220VS Jet midi lathe with a bed extension. The JWL-1220VS has a much slower "low" speed with electronic variable speed control, and with the extension would still cost less than the JWL-1236. You would need to mount the 1220VS on a workbench, or you can buy a stand for it, but the JWL-1220VS plus an extension plus a stand would cost more than the Jet 1236! The JWL-1220VS Jet midi lathe headstock doesn't swivel so you cannot do any outboard turning, but reviewers say that the JWL-1236 is underpowered for that type of work anyway. Next up the ladder we have the 14" Jet wood lathes, the JWL-1442VS and JWL-1442VSK. They are the same machine, but the Jet JWL-1442VS is a benchtop model, and the JWL-1442VSK comes with cast-iron legs. They have a 14" swing over the bed, and a 10" swing over the tool rest. Both offer a 42" distance between centers, with a 1 HP motor and 8 speeds ranging from 450 - 3000 RPM. The sliding and swiveling headstock has 36 indexing positions. The tailstock is hollow with a removable pin in the live center and 4" of ram travel. The Jet JWL-1442VSK with the cast iron legs is more popular than the benchtop version. I only found one review of the benchtop model (JWL-1442VS), and it was a 2-star review on Amazon. The owner wanted a higher top speed than 3000 RPM, and said that the speed control lever protruded into the work area. He was returning it. Owners say it is quiet and smooth, and most owners are very happy with it. The cast iron legs add a lot of weight (which is good), and the fit and finish get high marks. The Jet JWL-1442VSK does suffer from some of the same design quirks as the JWL-1236. The motor gets in the way with really large blanks unless you use an aftermarket chuck, and the 450 RPM low speed is still not slow enough for large turnings. It also uses the Reeves drive that requires the motor to be running to change speeds, and needs occasional maintenance. 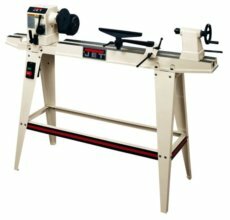 The mid-size Jet wood lathes offer a good value in their class, and all come with a 5-year warranty. They are solid, stable machines that have been out for a number of years, so parts are readily available if needed. The variable speed feature on these Jet wood lathes is much preferred over the other method of having to stop the machine and move the belt. The Reeves drive system has its quirks, but it is also a proven design that has been used in a number of different applications, including industrial equipment, transmissions, and other types of tools. Most owners are pleased with the mid-size Jet wood lathes, and they work well as long as you are using them within their capacity. No, they aren't well suited for large bowls, but for small to medium sized projects they work quite well. If the mid-sized Jet wood lathes are a little more than you need, take a look at the Jet mini lathes. If you want the ability to turn large projects off-center, Jet's 1642 series is a better option. 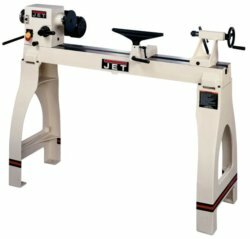 To get detailed specs on all of the Jet wood lathe models, visit the JET Tools website. Note: If you are new to woodturning or a veteran that is interested in getting more out of your lathe, there are tons of great woodturning books out there. The ones that are recommended most often for beginners on the woodturning forums are Turning Wood with Richard Raffan and The Lathe Book: A Complete Guide to the Machine and Its Accessories by Ernie Conover. Either of these books would be a great introduction to woodturning - I have an older edition of the Richard Raffan book and it has been a great resource for me as a beginning woodturner.